As we noted in our previous post, Cypriot President Nicos Anastasiades had sort of spoiled the surprise. Anyway, now it’s official: Polish Prime Minister Donald Tusk has been appointed new European Council President, and Italian Foreign Minister Federica Mogherini will succeed Baroness Ashton as the EU’s foreign policy chief (aka High Representative for Foreign Affairs). That said, Tusk is also likely to oppose fundamental changes to EU rules on free movement; although he did say that so-called ‘welfare abuse’ can be addressed, as we’ve noted, for many the debate has moved on from the issue of ‘fairness’ to that of ‘volume’, something Cameron will be under huge pressure to place at the centre of his potential renegotiation. In the more immediate future, Cameron’s early support for Tusk as new European Council President could increase the UK’s chances of securing a big portfolio in the new European Commission. Significantly, it has been confirmed that Tusk will also chair the summits of eurozone leaders – despite coming from a non-euro country. This looks like a big concession made, in particular, by French President François Hollande – who was reportedly sceptical of such an arrangement. Perhaps Hollande hopes that giving ground on this point can help him secure the key post of European Commissioner for Economic and Monetary Affairs for his former Finance Minister Pierre Moscovici. The resistance to Mogherini, put up by Eastern EU member states over the past few weeks, has clearly been appeased by Tusk’s appointment as new European Council President. 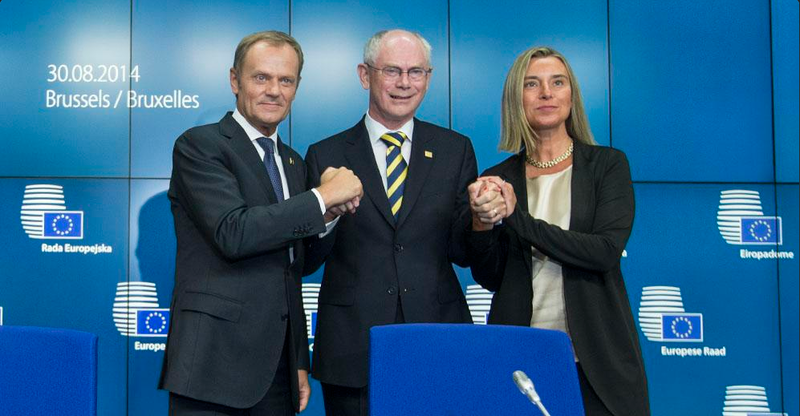 It was noteworthy that Herman Van Rompuy stressed that Tusk and Mogherini would “work closely together to secure Europe’s interests and values”. Italian Prime Minister Matteo Renzi, who has invested a great deal of political capital on Mogherini, seems to have achieved what he was looking for: a diplomatic victory in Brussels to sell to the electorate once back in Italy – where the big reforms are not going forward as fast as announcements, and the economic situation shows no signs of improvement. With the country in recession and deflation, it remains to be seen how much Italian voters will be impressed. As we noted in our recent flash analysis, the role of High Representative is less crucial from the UK’s point of view – as foreign policy remains primarily a national competence, with every EU member state having a veto. However, in light of the various geopolitical challenges facing the EU (and its neighbourhood), it is possible that Mogherini will play a greater – or at least more visible – role than her predecessor.